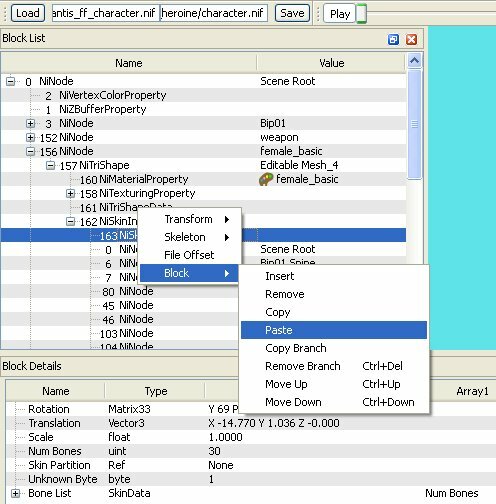 NifSkope .94, Nifconverter (ie EZNifconverter), A WORKING FFVTTR mesh (ie ActionGirl, NoCapeMan, etc), an FF mesh that “ghosts”. Open ActionGirl in NifSkope. Find and highlight “NiSkinPartition”. 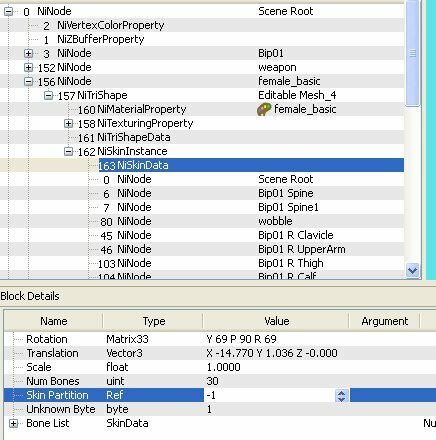 (In “View” have “Block Details” selected). 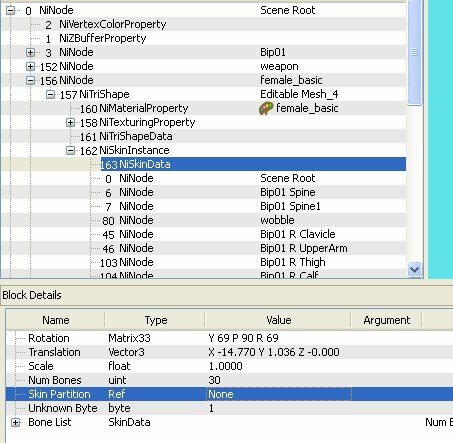 Right-click “NiSkinPartition”, select “Block”>”Copy”. 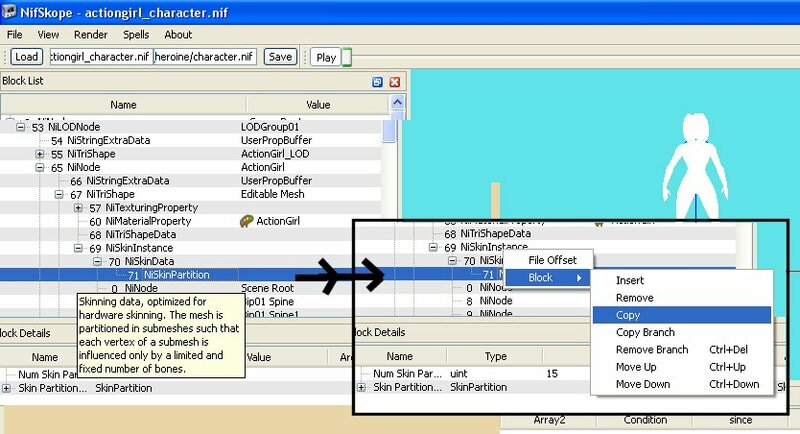 Load the Mesh to be fixed into NifSkope. N.B. DO NOT close NifSkope in between steps 1 and 2. N.B.B. The mesh MUST be female_basic based and nifconverted. THE “NiSkinPartition” BLOCK WILL APPEAR AT THE BOTTOM. Go back up to “NiSkinData”. 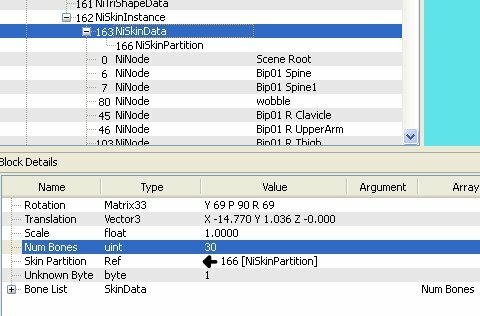 In “Block Details” highlight “Skin Partition” as shown. 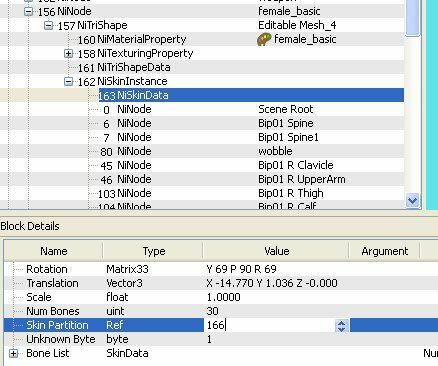 Double-click the “Value” field in “Skin Partition” to make it editable. Enter the value of the “NiSkinPartition” block (in this case “166”) into the “Value” field. Now “NiSkinData” will correctly link to our copied “NiSkinPartition”. Save the mesh.It should now work in-game without ghosting.